Professionally installed electronic dog fence systems in the Birmingham, Alabama metro area, with service extending to Tuscaloosa, Jasper, Cullman, Oneonta, Gadsden, Anniston, Oxford, Sylacauga, Clanton, Columbiana, Montevallo, and all surrounding areas. Known as Alabama's Pet Fence Experts, Pet Stop of Alabama has been one of the Top-Rated dog fence companies in the USA since 1994. 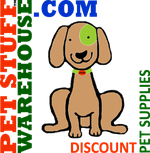 Discount Pet Supplies are found by the thousands at PetStuffWarehouse.com. Run by the pet management and dog fence experts at Pet Stop of Alabama, you can find many accessories and batteries for Invisible Fence brand pet fence systems as well as Dog Guard, Dogwatch, and PetSafe batteries and accessories. Dog beds, pet doors, flea & tick products like Frontline & Advantix, are just a few other discount pet products you'll find here.